I had a productive day down in the sewing room yesterday and was able to cross off some items from my long list. I had plans on sewing today, but ended up working in the yard most of the day until I couldn't take the 87 degree heat here in Atlanta. Neutral or Not Bee - Ella is the Queen Bee this month and she sent us all our fabric and a link to a tutorial to make this block. It really doesn't have a pucker on the right hand side..just a bad shot of this block. Books and Block Bee - Kelleigh is the Queen Bee and she is having us make a pinwheel block from the Modern Blocks Book (pg 138). I haven't mastered needle turn applique which is needed for the center of the pinwheel so that is missing. I keep practicing on a sample and it doesn't look great. I watched a good tutorial by Wendi Gratz but for some reason I just can't grasp it. If anyone does know how to needle turn applique a circle, please send me some hints....please. Here is what my blocks look like so far from me being the Queen last month for Books and Block. Just need to receive 5 more blocks and I can sew them together and send it off to a QOV long arm quilter. Love being in these bees and having my bee mates helping me make my QOV quilts. I'm making a quilt for a special lady that is retiring this summer. I happened to ask what her favorite color is and she said navy blue. So I went out and searched quilt shops for navy blue fabric. Navy blue is not a easy fabric to find. I bought 9 different blues (not all navy) and have completed a total of 72 blocks for this quilt. Just need to piece them together and send it off to a long arm quilter. All 72 blocks ready to be pieced together! So much more to do on my list before family arrives in two weeks for a 3 - 4 week stay. I'm not going to have much sewing time once they arrive but that is OK because having our 3 grandsons here will be fun. I'll just be posting about them instead. 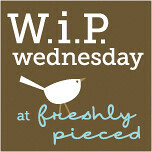 I'm linking up to Lee at Freshly Pieced! love those blocks and it's always worth giving up sewing time for grandkid hugs and kisses.